The Elliot State Forest seems like it's just made for road biking. This profile follows one of the principal thoroughfares through the forest, Camp Creek Road. On this orad I saw less than 5 cars, but probably more than 5 million trees. Pictures on this page were taken on the lower section of Camp Creek Road. That road can lead to many other summit points. Also: to approach this summit you do not have to use that part of the road in the pictures. From West. This profile follows all of Camp Creek. Along the way are tempting turnoffs into forest tunnels: Buck Creek Road, Otter Creek road and others. Many types of forest are visible from the saddle. But the mossy vegetation enveloping Camp Creek on the lower and middle stretches are the most fascinating. The climbing does not really start till after the junction with Lindy Bridge Road. This turnoff is labeled, but you have to look closely. 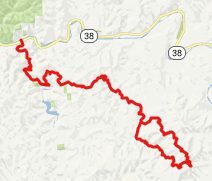 BLM 23-8-28: Elliot State Forest , Buck Creek /Lindy Bridge Road s(u) , Buck Creek Road via Soup Creek Road(sh) , additional out and back: short distance south of jct Camp Creek Rd - Loon Lake Rd > up Camp Creek Rd > up Buck Creek Rd > Buck Creek Rd s(u) > Ash > turnaround point Loon Lake Road at end of pavemnt << back up Soup Creek Road with several miles extra out and back, while looking for a lost lense cap > Buck Creek Rd via Soup Creek Rd(sh) > down Lindy Bridge Rd > up Camp Creek Road > up BLM 23-8-28 > BLM 23-8-28 s(u) > down Smith Ridge Rd 83-9-13.1 > down Camp Creek Road back to starting point: 64.6miles with 5030ft of climbing in 5:54hrs (r2:13.8.1).